Getting organised gives you a LOT of benefits - calmer days, a tidy house, food on the table when you need it, clean washing ready to wear and most importantly - less stress and more peace! Motherhood is a juggle and being organised is a great way to handle it all. But you shouldn't have to do it all on your own! You're getting organised so your whole family can enjoy the benefits. 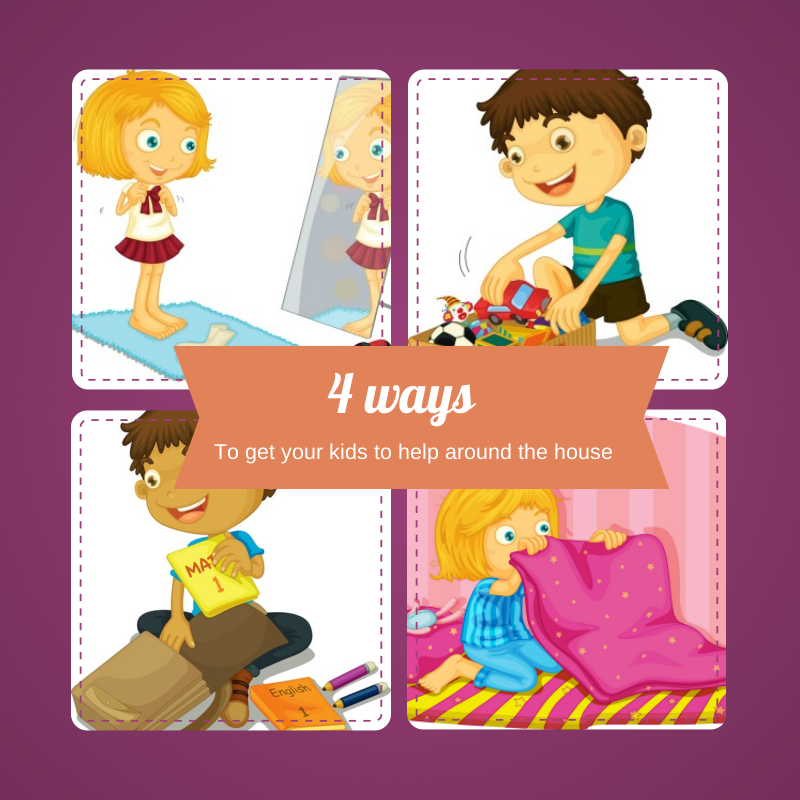 It's not unreasonable to ask them to help out and share the workload around the house. 2 - 8 years: Young ones can help too - tidying toys, making beds, setting the table. "Kids, we're going out in a minute to all play together in the backyard (yay! ), so first I need you to pick your toys up off the floor and put them in the toy box, then we can all go play together". Why this works: The kids have something exciting to look forward to (a play outside with mum) so that becomes the main focus of your sentence, and they're happy to do what's asked of them. Let's break it down - 1. You offer something fun. 2. You let them know what needs to be done first. 3. You mention the fun thing again at the end of your sentence as a reminder. You can substitute the play outside with anything your kids like, and it doesn't have to be something out of the ordinary - you can offer something you would have done anyway. It's how you sell it that matters - let your tone of voice show that you're excited for the fun part as well! 8 - 12 years: At this age kids can help around the house with more detailed tasks like helping prepare dinner, sorting washing, putting their own washing away, as well as the basics like tidying and making their own bed. "Honey, I need some help getting dinner ready. Would you like to set the table or get the drinks ready?" Why this works: You're giving a guideline for what you need done, but you're also giving freedom to choose. The focus is on the idea that they're old enough to decide for themselves and you appreciate their help, but you're still holding your position of authority as a parent. 12 - 18 years: This is an important age for kids to learn how to do things around the house - it's really only a few short years until they'll need to look after themselves in their own home so now's the time to practice cooking, cleaning and organising. It's also the time kids are looking to earn money, or take control of their own lives - this is your point of leverage. A) The cash offer: Grab a small box with a lid and some small pieces of paper or card. On each piece of paper, write one household job (vacuum, wash the car, clean the shower, etc). Put all of the papers into the box and keep it somewhere everyone can reach it. Sit down with your kids and set the minimums required to receive weekly pocket money (e.g. keeping room tidy and washing dishes after dinner), then offer bonuses :for extra jobs done around the house. (Depending on your financial situation, this could be anything - 10c per job, $1 per job, whatever works for you). When they're ready to do a bonus job, they just grab one out of the box and do it! When it's done they come to you and let you know so you can 'pay' them for their work. The incentive for them: The cash! Why this works: Nothing is out of their reach now - it just depends on how hard they're willing to work for it. And it takes the pressure off you - every time someone asks for 'this new toy' or 'that new game', they can absolutely have it - once they've earned the money for it. B) The barter system: Sometimes the cash incentive doesn't work - your kids may be earning money already through part time jobs, or you may not be financially able to give bonuses. Instead, try the barter system - offer to help your kids with what they'd like to do, in return for help around the house. For example - you'll drive them to work if they do the dishes after dinner, they can go to soccer if their room is tidy when it's time to leave, they can go to that party if they've mopped the floor. The incentive for them: They get to do the things they want to do! Why this works: The framework is set clearly, so they know exactly what to expect if they don't help out. This means you don't need to nag about it. If their jobs are done, they can do their activities. If not, that's ok, but it means they can't go to their sleepover, or they'll need to catch the bus to work or call in and say they can't do their shift (in my experience, this rarely happens - the job gets done!). Husband / Partner: The simplest way to encourage your partner to help you around the house is to ask - and be really specific about what you're asking. What NOT to say: "Can you please help me around the house more? I've got too much to do and I shouldn't be the only one doing it"
"Would you please take the rubbish out when I've finished clearing the table?" "Would you please hang the washing that's in the machine while I run the bath for the kids?" "Would you please read the boys a story in their room while I finish preparing dinner?" The incentive for them: Your partner sees that they are an important part of family life too and you value their contribution. Why this works: You're request is clear & specific and there's no risk of you saying "No, you didn't do it the right way" (which is something I hear a lot from partners when asked about helping around the house). The use of the word 'would' is important - not 'could'. It's a very small difference but using 'could' is essentially asking if they are capable, whereas 'would' is asking for help. And remember you tone plays a huge part when you ask - you're not nagging, you're asking. Sometimes when I suggest this technique to clients they say "But I shouldn't have to ask my partner to help - they should just do it anyway!". That's absolutely true. But in their case, it's not realistic. In short, if you're partner doesn't help out as much as you need them to, and what you're currently doing to encourage them isn't working, then it's time to try a new idea. Know someone who would like this post? Share it with them using one of the buttons below! Just pinned this to my Baby/Kids/Parenting board! Thanks SO much! I am very much impressive for those tips and those tips are very helpful especially for those kids who wants to help their family to organize their house. Thanks for sharing it.